If you love the Samsung Galaxy line of tablets but prefer the Windows OS, the TabPro S is an enticing option. This 2-in-1 tablet delivers a Surface-like experience with a Samsung spin that should make mobile professionals more than happy. Thanks to solid hardware and superb Windows integration, it could be a runaway hit with the right audience. Sheathed in grippy faux-leather plastic accented with polished metal bezels, this 1.53-pound tablet makes a good impression at first glance. Its unique cover boasts a full-sized detachable keyboard with an integrated touchpad that can be adjusted to the angle of your choosing. The 12″ Full HD Super AMOLED display is just 6.3mm thick and sports 2160×1440-pixel resolution. The TabPro S comes with either a 128GB or a 256GB SSD, 4GB of RAM and a zippy 2.2GHz Intel Core M3 CPU. The on-board battery is a robust 5200mAh model that provides plenty of juice for office work and media playback alike. In addition, there’s a 5MP front camera as well as a 5MP rear lens with 4X digital zoom. Unlike most Samsung tablets, the TabPro S comes pre-loaded with Windows 10 Home Edition. As you’d expect, all the usual Microsoft productivity tools like Word, Excel, Outlook and Powerpoint come along for the ride. The well-stocked Windows Store has many more apps as well as movies and music. In addition, the TabPro S supports XBOX media streaming. All the usual networking protocols such as Bluetooth v4.1 and Wi-Fi come standard on the TabPro S as you’d expect. Mobile broadband is also an option. As far as ports go, there’s USB C 3.1 and little else. An optional Bluetooth stylus is available as an accessory. Galaxy phone owners can pair their handset to their tablet using NFC. Thanks to the dual-core Intel Core M3 under the hood, the TabPro S never seems to lag under the weight of running a full Windows 10 installation. The battery delivers up to 630 minutes of operating time and can be fully recharged in less than 2.5 hours. Capable of a 4148 score on GeekBench, the TabPro S holds its own against competing tablets. 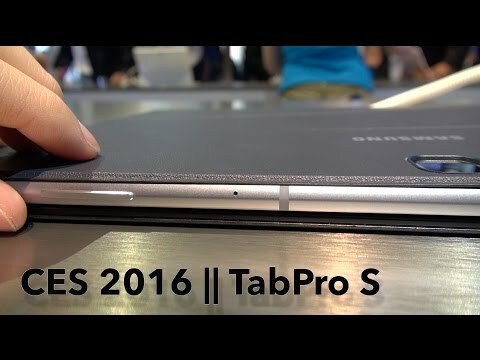 On the upside, the TabPro S is sleek, polished, versatile and powerful. It delivers a full Windows 10 experience for the same price as the Surface Pro 4 and offers a new twist on the hybrid tablet with its novel sliding display design. The only minor problem with the TabPro S is its less-than-stellar keyboard. If you’re looking for a tablet hybrid that can truly double as a full-featured laptop, the Samsung TabPro S should be on your shortlist. While it’s the obvious alternative to the Microsoft Surface Pro 4, it might just lure a few iPad fans away from the Apple fold if given a chance.